After a frosting experiment recently, we were left with four stray egg yolks. As you may recall from our Trifle post, we don’t like wasting anything, so Tia suggested I make her a custard with the remaining egg yolks. 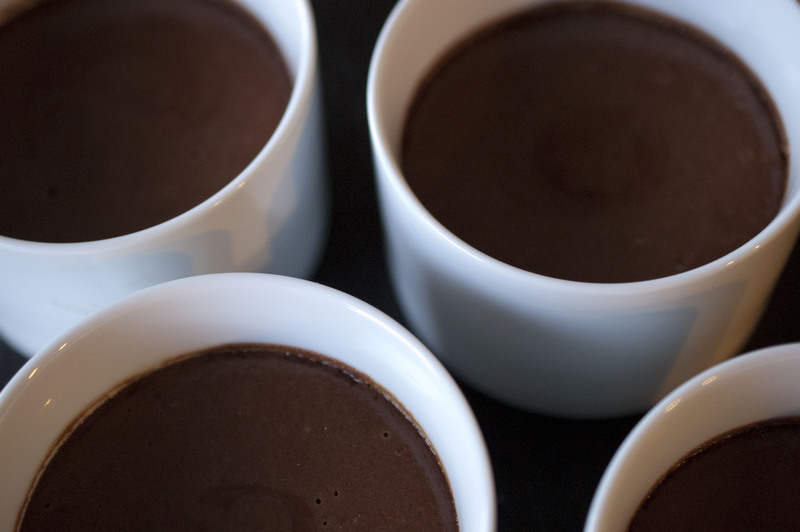 Adapted from Amy Wisniewski, chow.com, we used semi-sweet chocolate instead of bittersweet and used 4 small coffee mugs instead of 6 ramekins. Heat oven to 300°F and set rack at center of the oven. Bring 4 cups of water to simmer over medium heat and arrange 6 (6-ounce) ramekins ½ inch apart in a large baking dish; set aside. 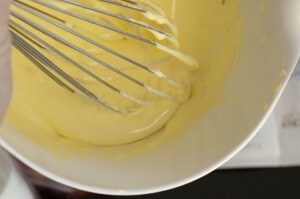 Place cream in a small saucepan over medium heat and bring it to just a simmer. 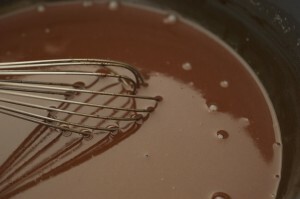 Remove from heat, add chocolate, and stir until completely melted, about 3 minutes; set aside. 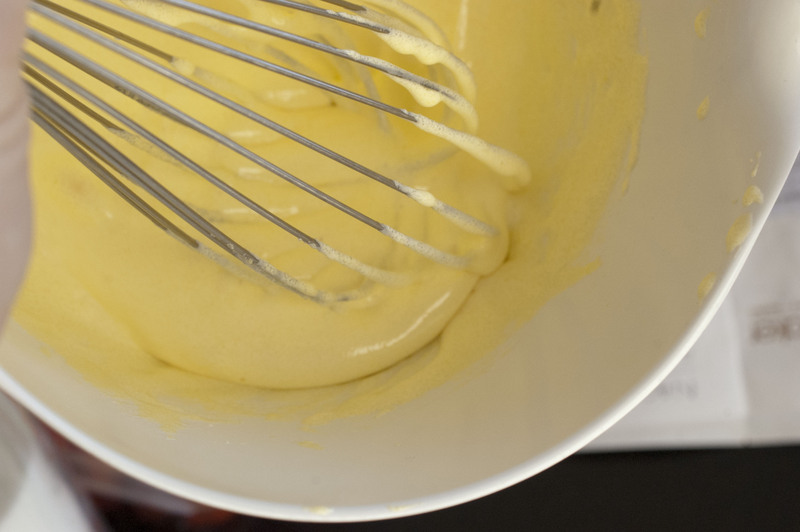 Whisk sugar and egg yolks in a large mixing bowl until thickened and pale in color, about 2 minutes. Slowly whisk in ⅓ of the chocolate mixture, then add the remainder while constantly stirring (try not to incorporate any air). Place a fine mesh strainer over a large measuring cup or a bowl with a pouring spout and pour custard base through strainer. Evenly divide strained custard into ramekins. Tap each ramekin a few times to break any bubbles that appear on surface. Place baking dish in the oven and carefully add enough of the simmering water to reach 1 inch up the sides of the ramekins. Cover the dish with aluminum foil and poke several holes in the foil to allow steam to escape. Bake 25 minutes or until the outer 1 inch of each custard is set (centers will still be slightly jiggly). Remove the ramekins to a rack and let cool to room temperature, about 1 hour. Serve immediately or cover and refrigerate up to 4 days. If refrigerated, let them come to room temperature for 20 minutes before serving. Hooray! Something I can eat! I (very unfortunately) am gluten-sensitive, so most pastries are verboten. Love you blog! !